The Premiair PMD1608 Mini Dehumidifier is a compact dehumidifier with a limited water extraction capacity suitable for use in small enclosed areas such as closets and cupboards. It operates by means of a thermo-electric process employing the Peltier effect. In simple terms an electric current passed through two different materials produces heat on one side and a cooling effect on the other. The cool side is used to condense water vapour from the air to reduce the moisture content. This process is only suitable for small areas and is less efficient than that used in a conventional refrigerant dehumidifier although in absolute terms the energy consumption is equivalent to running a 60watt light bulb. The primary applications for the Peltier process are for portable coolers and industrial and military applications where the special circumstances make this type of dehumidifier the preferred choice. The Premiair PMD1608 Mini Dehumidifier is capable of removing 0.35 litres of moisture from the air at 30°C and 80% relative humidity. In cooler conditions and/or when the air contains less moisture the amount of water collected will be less. Even the smallest of room dehumidifiers will remove seven or eight litres per day so this dehumidifier is clearly not suitable for use in a room, however small. The Premiair PMD1608 Mini Dehumidifier will be effective in an enclosed space such as a closet or a wardrobe. It is unlikely to be powerful enough for a walk-in closet unless it is extremely small. The PMD1608 requires a continuous supply of mains electricity. If the only available power outlet is located outside the closet the door will need to remain open sufficiently to allow access for the cable. 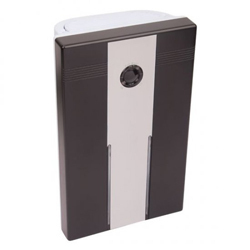 The PMD1608 Mini Dehumidifier has a water collection container with a capacity of 2 litres. Once the container is full a warning light will be illuminated and the dehumidifier will switch off. The size of the container is an advantage in so far as it reduces the frequency with which the container needs to be emptied. The disadvantage of such a large container is that it increases the overall size of the dehumidifier quite considerably. The unit is quite compact measuring 20.0 x 12.0 x 32.0cm. In relation to its moisture removing capacity, however, this is a relatively large dehumidifier. The weight of the dehumidifier is 2.75kg. The PMD1608 Mini Dehumidifier will operate in ambient temperatures of 15°C to 35°C. This restricts the unit to use in the normal living areas of the home. It would not be suitable for use in cooler areas such as a cabinet used to store tools in a garage in cold winter weather. The noise level of the PMD1608 Mini Dehumidifier is stated by the manufacturer to be less than 40dB. Peltier coolers have no moving parts but for dehumidification to be effective air must be drawn through the dehumidifier. This requires a fan which will produce some noise. Dependent on the actual volume of noise produced, which is not available, this unit may be audible within the room in which a closet or other storage cupboard is located. The dry air leaving the unit will be warmer than the intake air, due to the nature of the Peltier process which produces heat as well as cold. This will be an advantage in a closet where raising the temperature lowers relative humidity (warm air "holds" more water than cool air) thus reducing the risk of water vapour condensing on to clothing and other items. The Premiair PMD1608 Mini Dehumidifier will do the job it is designed for and uses a technology which will be new to many prospective buyers. The principal question is whether such a sophisticated appliance is needed to control humidity in a closet. If a closet is damp, and the room within which it is located is not, it is most likely that damp is penetrating an exterior wall against which the closet is built. Remedies for the damp penetration should be sought before resorting to a dehumidifier. If the entire room suffers from excessive humidity and resulting condensation a dehumidifier for the room will be a more cost-effective solution. Simply leave the closet door open and it will dry with the rest of the room. If a closet dehumidifier is required a rechargeable dehumidifier, or even two, may be a preferable option. A rechargeable dehumidifier passively collects water using a desiccant material. It has no fan, no water collection container and is not permanently attached to an electricity supply. It simply needs to be connected to a power supply every few weeks to regenerate the desiccant. Typical examples are one half the size and one third the weight of the PMD1608, are silent in operation and cost between one quarter and one third of the price. Our conclusion is that dehumidifiers of this type are too much technology for too small a problem, a problem for which equally effective, cheaper and more convenient solutions are available. Full details of the Premiair PMD1608 are presented in the table below.